The Miami star makes the highlight shows with scoring and dunks, but he is no slouch at the other end of the court. The next challenge might be stopping Dallas' Dirk Nowitzki. There's the powder toss before the game. There are the high-flying dunks, and passing ability. As the Miami Heat forward continues to improve as a player, another aspect of his game will be added to the list. Although his scoring has been the talk of the playoffs, his efforts at the defensive end have played just as much of a role in the Heat's advancing to the NBA Finals. The best-of-seven series against the Dallas Mavericks begins Tuesday at AmericanAirlines Arena. "That's my favorite part of the floor," James said. "Offense gets all the headlines, but what I do defensively, it's all about that." James was a first-team all-defensive selection. He has guarded all five positions at some this season. In the playoffs, he slowed Boston forward Paul Pierce while also showing versatility against point guards such as the Celtics' Rajon Rondo and Chicago's Derrick Rose. "We knew he was an excellent defender before this year," forward Chris Bosh said. "He definitely should have been brought up for defensive player of the year [James finished ninth in the voting]. I think that is a goal of his, to be the best defender as well. He's looking to become that complete player … You can put him at one through four [positions] on offense and he can guard one through five on the other end." James could face his next big challenge against Mavericks forward Dirk Nowitzki, who has averaged 28.4 points during the postseason. Heat Coach Erik Spoelstra said James won't draw the assignment specifically, but the scenario will occur at times. "Because of the way we defend and rotate, sometimes that will happen," Spoelstra said. "He's versatile enough that he'll probably guard all of their players at least a handful of possessions at least at some point in the series. That's the way we've been doing it for the last 2 1/2 to three months. I don't see that changing in the series." James said he'd welcome the challenge of stopping Nowitzki, who is coming off averaging 32.2 points against Oklahoma City in the Western Conference finals. A 13-year veteran, Nowitzki has been called one of the league's toughest covers because of his size (7 feet) and shooting touch. He shot 39% from three-point range this season, before making an incredible 52% beyond the arc in the postseason. 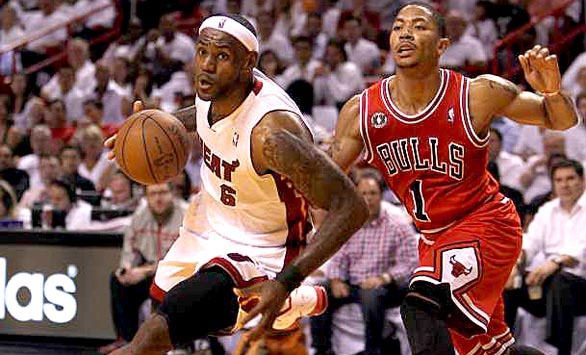 "I guess people see me as a really good defender and him as the best offensive player," James said. "So they automatically put me on him. Whatever it takes, if I need to guard him throughout the course of the series, I will." James, who considers himself a student of the game, watches endless hour of video to learn a player's offensive tendencies. With Nowitzki, he said it's a matter of just making things difficult.